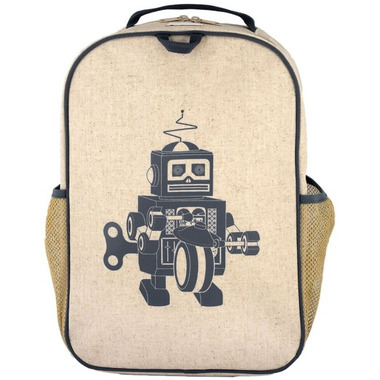 The Grade School Backpack is the big sibling to the Toddler Backpack and fits kids aged 6-11. It has ample space for large binders, gym clothes and books with room to spare. 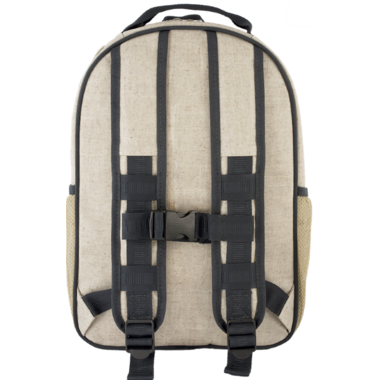 It Features a raw linen exterior with a nylon lined interior and 2 side mesh bottle pockets, as well as interior mesh pocket. A chest clip keeps the bag securely on while skipping, jumping, running, or any other high energy activity. Care Instructions: While the raw linen has a porous nature, tough stains such as ketchup just require a little bit of scrubbing to remove. The biggest advantage of these products is that they can be completely immersed in water, making them machine washable and dishwasher safe. You can then simply lay them out to dry overnight. Putting them into a hot dryer is NOT recommended as it may shrink or melt certain materials in the bag. My 5 year old loves this bag. Roomy enough for lunch and the school folder without being too heavy. Only wish it was waterproof.